The latest season of “What Will Susan Collins Do” ended Friday afternoon after 88 days of the Mainer expressing public indecision over whether she would vote to confirm Brett Kavanaugh to the US Supreme Court. The dramatic conclusion: Collins is a Republican — and she, like nearly every member of her party in the Senate, will approve Kavanaugh’s appointment. 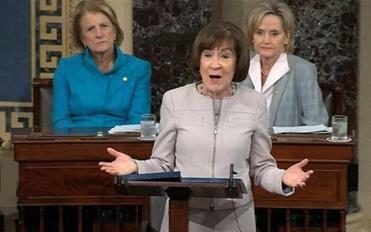 Delivering a 44-minute-long speech on the floor of the US Senate, Collins detailed how she had 19 lawyers holding thrice-weekly meetings on the nominee; the lengthy conversations, in person and over the phone, that she had with Kavanaugh; her analysis of his previous decisions; and that she didn’t believe Kavanaugh sexually assaulted Dr. Christine Blasey Ford, as the California professor alleges, when they were both teenagers in the 1980s. In the end, Collins announced she would vote to confirm Kavanaugh, all but ensuring he will end up on the court. He was the sixth Supreme Court nominee she has considered and the sixth she has approved. “Mr. President, I will vote to confirm Judge Kavanaugh,” Collins said at the end of her speech. The announcements by Republican Susan Collins of Maine and Democrat Joe Manchin of West Virginia ended most of the suspense over a political battle that has transfixed the nation. In fact, during her 21 years in the Senate, Collins has voted for judicial nominees put forward by Republican presidents nearly 99 percent of the time, according to a Globe analysis of her roll call votes. Given that Kavanaugh is on track to be confirmed with 51 votes, each senator’s support was critical to his confirmation. The only difference between Collins and the other 49 Republicans voting yes is the way she held off from announcing her decision. But for the last month, Collins has been one of the most-watched elected officials in US politics. When the confirmation hearings began, television pundits wondered out loud how she, specifically, viewed the proceedings. After Ford came forward with her allegation in the Washington Post, Collins got Kavanaugh on the phone and talked to him for an hour. She filled an auditorium in New Hampshire, where she talked in detail about how she would make her decision. By Friday, reporters speculated about what she ate for lunch with Senate majority leader Mitch McConnell. Even as the day unfolded, she kept her decision close to the vest, while one of her GOP colleagues, US Senator Lisa Murkowski of Alaska, voted against proceeding with Kavanaugh’s confirmation. Collins insisted that her procedural vote for Kavanaugh in the morning had nothing to do with the decision she made in the afternoon, which was delivered through her floor speech and dispersed in writing to inboxes soon after that. The moment Collins announced she voted yes, West Virginia Democrat Joe Manchin, a Democrat facing reelection next month, announced he would do the same. This isn’t the first time that there’s been such fanfare over a Collins decision. In the past two years, she played coy on whether she would vote for Donald Trump (she did not), whether she would vote to keep the Affordable Care Act (she did), and whether she would vote for a major tax reform bill (she agreed to it at the last minute). A year ago, when Collins held up her entire state and the US Senate as she made a decision about whether to run for governor. A year later, it’s clearly a key role that she relishes.